It’s difficult to read beach volleyballer Kerri Pottharst’s The Business Of Being An Athlete and not be motivated to pull out a piece of paper and start writing your own life goals. Pottharst’s inspiring discipline is woven into every aspect of this book, from the importance of having ‘the big dream’ down to the effective use of websites and social media to build a money-spinning profile. 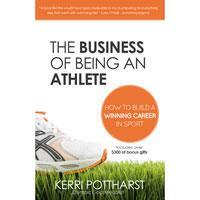 After all, being a gold medal winning athlete is indeed a business like any other, and Pottharst clearly and frankly outlines her winning formula that centres on setting measurable goals, and having the steely resolve to act until they are achieved. Topics that one would expect from a ‘sports book’ such as nutrition, and sports recovery take a relatively small role, with the main content covering goal setting, planning, communication with stakeholders and building an ‘A’ team to support your endeavours. Pottharst emphasises the importance of team, which she describes as not only those that walk onto the court with her, but her support crew, friends and family. This is a great reminder that not all stakeholders in a project or business are obvious—we need to be aware of the peripheral stakeholders that can impact on project success beyond the standard project team and client representatives. Pottharst is a big fan of self-help books and The Business Of Being An Athlete offers a condensed view of her favourite components, with the section titled ‘Belief’ dealing with challenges, confidence, overcoming negative self-talk and achieving balance in life. While these matters can obviously have a huge impact on performance in the ‘head game’ of athletics, this section does provide excellent food for thought for anyone seeking to improve their performance in their chosen profession. The book is a study in what can be achieved with planning, discipline and focus that one would expect from an athlete of Pottharst’s experience and achievements. While it is undoubtedly a valuable tool for emerging athletes, it’s a motivating read for anyone seeking to be a ‘winner’ in their career of choice. Adele Whish-Wilson is the founder of Momentum Technologies, an award-winning technology solutions company. Since selling the business in 2010, she has combined her background in the private, community and government space with her experience in business development to become an independent consultant, finding ways for organisations to use technology to improve business communications and operations. Adele Whish-Wilson has written 2 articles for us.